Sharebutton-01: Tutorial of the composant Sharebutton of the PHP FrameWork WebSite-PHP. To use Sharebutton, you need to connect to the admin interface of the framework WebSite-PHP. 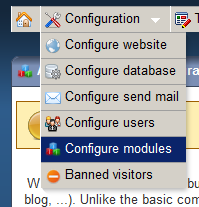 Once connected you will go to the menu Configuration -> Configure modules and enable the module Sharebutton.